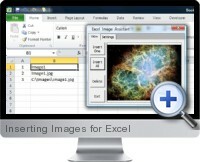 Excel Inserting Images is an Excel add-in with a menu that assists with inserting multiple images into Excel cells and cell comments through automation based on specified rules. The add-in for inserting images also acts as an image viewer for displaying larger versions of the images inserted. Insert pictures into either cells or cell comments with the same base importing commands. Insert the images file paths into cells as either an alternative or addition to the inserted images. Bulk inserting of images can be automated by utilizing the file paths specified in cell values with options of using combinations of file name, extension and full path information. Choose to insert all images from a specified directory folder. Images are automatically resized based on row height with aspect ratios maintained. Product catalogs and image rich presentations can be emailed and shred with images embedded into the Excel file. Excel Inserting Images is designed to integrate easily with backend product databases and ERP systems by utilizing product information to generate file paths and subsequently embed images with the information. The Excel solution is compatible with all versions of Excel from 2000 to 2013.